Gadgets are virtual items or tools that you can buy, activate, and use during the game in exchange for gold. You can simply reach the nearest spot by the cklick of a button and jump over all the way to it. That might give you a crucial advantage if time is getting short. In a multiplayer game you can blind your opponents for two minutes so that the won’t see spots or co-players on the display any more. 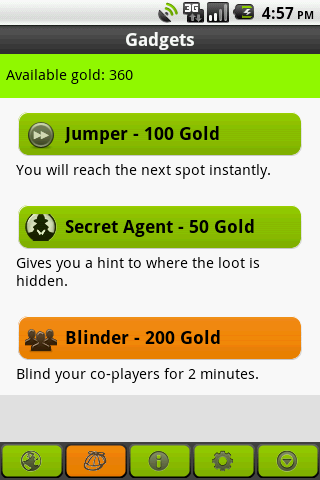 In exchange for a certain amount of gold the the secret agent gives you a hint about where the hide-out with all the stolen gold might be.